The Whole Enchilada » Darrin Phegley – Capturing Life! 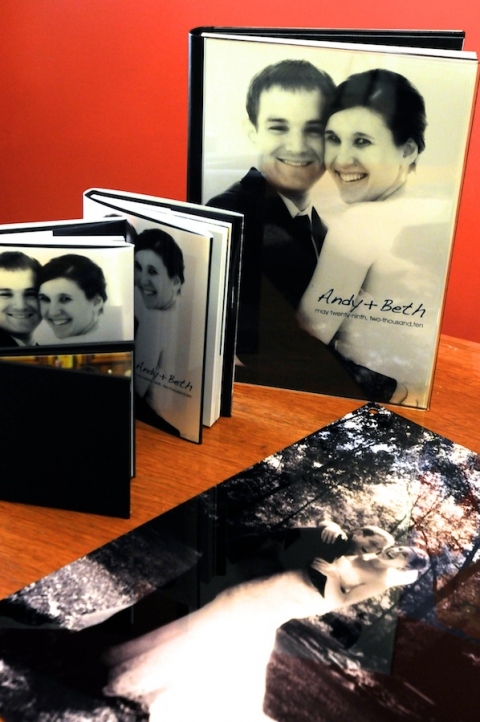 The book and print collection from my Complete wedding package. Andy & Beth Freeze’s wedding. Clockwise from top: GraphiStudio’s 60 page – 9.5×13″ coffee table book with thick pages and acrylic transparent cover, 16×20 metal print with holes drilled for standout studs, 2-DVD set in portfolio book case with highlight prints, 2-6×8 GraphiStudio parent books that are exact copies of the larger book. GraphiStudio is an Italian-based book company that prints and binds incredible books. The metal print is from my long-time photo lab American Color Imaging. Only things not pictured are the single prints.